Good Golly Ginger: I'm back from DEAD...Happy New Year! I'm back from DEAD...Happy New Year! Thankfully for Sir Alexander Fleming and his discoveries in antibiotics, I am now on the road to wellness. This germ has wiped out my family for about two weeks now, but we are making a slow recovery. I won't go into all of the booger-y details, I'm sure you have had your own mess to deal with, but suffice to say I am so thankful for oranges, antibiotics, and chicken noodle soup. The blog has waited in the two weeks of my unanticipated blog sick-cation. It is still here, and hopefully so are you. 2013 has been an amazing year. I started blogging in August, and it has been so fulfilling. I am so thankful to my readers. Over 50 blog posts later (whew!, I didn't know I could write that much), thank you so much for all the comments and the praises! With almost 100 followers on bloglovin' (I'm speechless! ), thank you for reading! What does 2014 hold in store? Hopefully, more, more, and more quilts. I am really looking forward to designing and putting out my own patterns in 2014. I've really enjoyed participating in 2013 quilt alongs, and I'm sure I will continue to do a few quilt alongs in 2014 as well. Destash my stash? Nope. Not here. 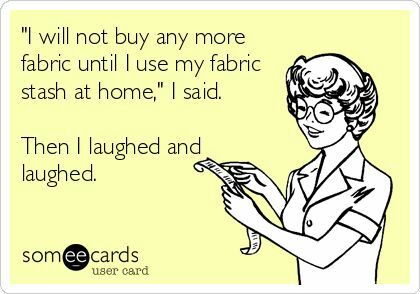 I don't have enough fabric in my stash to commit to not buy anymore fabric. However, I am going to make better choices in my fabric buying. I'm going to buy in mostly fat quarters so I don't have a lot of leftover scraps. I will try not to succumb to all those flash sales. Ha ha ha. I'm laughing at that one already. I've already signed up for a stash building club in 2014! I wish you all a wonderful and happy New Year! Thank you so much for taking the time to read my blog. I am looking forward to all the creativity that 2014 has to bring! Pushy, you were gone for a week, you can't get rid of us that easily! What a busy couple of months you have had, and so productive and such a fabulous response (100 followers in 4 months is something to be proud of!) glad you're feeling better, looking forward to what 2014 brings and what you'll make of it. Thank you so much. Your sweet comment made me feel much better. Blog-world is Awesome! I'm so happy to be back, and looking forward to the next 365 days...oh, the things that can be created! Glad you are feeling better. Nice projects! Pleased to hear you are feeling better. I quite agree with ee card quote, fabric acquisition is an addiction. How often I said that only to give in when I see something I have to have! Yes, I can only go so far as to not buy more fabric for the month of January! Anything more than that is ludicrous! Thank you for finding me! :) Have a lovely day. I know...my head is already spinning about all the opportunities. Thank you for visiting. Such beautiful projects! I am in love with that weekender, especially! I can't wait to see what you make in 2014 and I look forward to seeing your patterns! I love your goal of "more, more and more quilts.". Sounds like an awesome plan. Yes, nothing too specific there, right? Since 1 quilt was made last year, my goal seems pretty attainable, and I definitely don't want to limit myself to say 14 quilts are going to be finished this year. :) Thank you for stopping by! Looks like you've had a pretty wonderful 2013! I can't wait to see what you create in 2014. And congratulations on the success of your blog - isn't it fun? Oh good, someone not on a fabric diet. :) I'm with you- my stash isn't quite big enough to stop quite yet. Not quite yet. Nice job this year and I'm excited to see what you design & make in 2014!